This bit of prose induced a single tear to fall to the sheet below my face. It had been hours, propped by three overstuffed pillows, so engrossed in the story I couldn’t peel myself away. Eleanor finally allowed some light, some hope, a smidgen of joy to buoy her. The relief swelled my heart and I had to stop for a moment. Not since White Oleander has a book elicited tears. 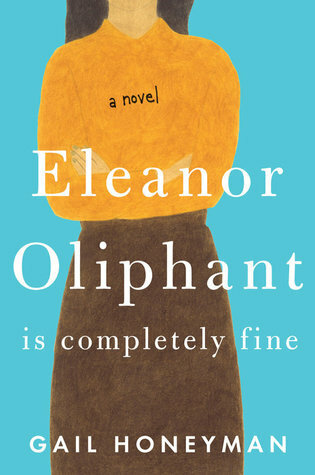 Eleanor Oliphant is Completely Fine will sustain you through this month of hearts and flowers and yet, it it not a romance. It is a study, an observation, a dive into a character that is wacky, weird, devoid of social skills. She is engulfed in loneliness without knowing it, swallowed in awkwardness and its consequences. Gail Honeyman’s debut novel makes every writer on the planet envious. This is a first try, a premier attempt, and it wins the 2017 Costa Debut Novel Award. In the British Book Awards for 2018, it’s the “Début Book of the Year” and “Overall Winner” awards. Even the audio version won the 2018 US Audie Award for Fiction. Oh, and Reese Witherspoon’s production company optioned the movie rights. Honeyman reports she quit her job and now writes full time. Good girl. The funny thing is, in the beginning, Eleanor seems far from fine. Three quarters of the novel, we scratch our heads at her lack of self awareness, her blunt blurtings, her disdain for the social and her disregard for dresses and shoes. Wait, that last part might be just me. As the story unwinds itself, we wonder, given the same circumstances, what would be our set of leftovers? Would we be social, wise, warm, funny? Or would we, like Eleanor, live mostly in our heads, fall in love with a stranger and drink vodka all weekend until it was time to go to work again. If the vodka part makes us antisocial, unaware, lacking in esteem and disjointed, are we not almost there at times? Are we not just circumstantial steps from becoming our own variety of Eleanor? Rarely does a story make us laugh, cry, rail at the world and cheer an unlikely heroine as much as Honeyman’s crafting. She is a master. She’s at work on another–part of the multi-book, six figure auction deal she got for introducing us to Eleanor. The excitement is palpable especially since she remains mum on subject matter and characterization. She lets us know her impetus for Eleanor circled thoughts of those who are not only lonely but isolated. How did they get from where they started to where they are? And for any of us who’ve scraped the bottom, Eleanor’s musings cut to the quick. Duchess Dolls–you’ll rally round this one. It’s easy-peasy available on Amazon here. This is one where you want the physical book so when you finally close it, you can hold it to your chest before you pass it on to your bestie. Discuss amongst yourselves and share your thoughts with the rest of us. Go, pour some wine and read.